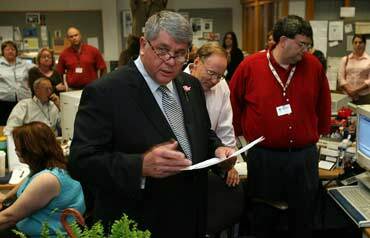 (Biloxi) Sun Herald Executive Editor Stan Tiner thanks the staff after the announcement that the paper won the 2006 Pulitzer Gold Medal for Meritorious Public Service. Gold Medal for Meritorious Public Service Journalism that the newspaper won for its Hurricane Katrina coverage. Eight months after Hurricane Katrina brought the Gulf Coast to its knees, the (Biloxi) Sun Herald does more than survive – it flourishes. 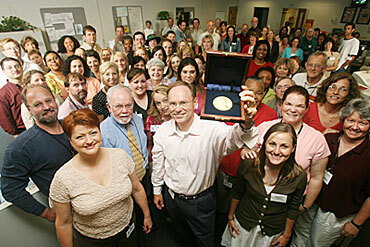 In recognition of its work in guiding the community through its darkest hours, the Sun Herald won the 2006 Pulitzer Gold Medal for Meritorious Public Service – journalism’s highest award. Executive Editor Stan Tiner dedicated the award to the people of South Mississippi, “who will not be defeated.” Employees celebrated Southern style, with sweet tea and cookies. The Sun Herald’s determination and tenacity is being recognized throughout the newspaper world. The paper was recently awarded the 2005 Sigma Delta Chi Award for Public Service in Online Journalism from the Society of Professional Journalists. While everyone shares the glory of the editorial recognition, employees are most encouraged by the fortitude of their colleagues. Human Resources Manager Wanda Howell says that about half the employees sustained severe damage to their homes, and more than half of those found their homes uninhabitable. Of those, more than half are still living in temporary housing. Despite uneasy circumstances, everyone is buoyed by the role the newspaper played in the community. Advertising Director Vicki Barrett says readers and advertisers learned something important. “I’ve got news for people who say the print product is dead. We’re more relevant than ever,” she said. The free papers were the “biggest sampling program in newspaper history.” Raskett said. And though it was designed as a public service, it also served as a sales tactic for the paper that lost 32 delivery routes in the devastated region. The other upbeat news is that the reliance on discount subscriptions, standard before Katrina, has disappeared. Ninety percent of home delivery is now paid in advance at least three months. Eighty percent of those subscriptions are at full rate. You’d expect a lot of gloom from Ad Director Barrett, who watched casino revenue plummet 71 percent and department store revenue sink by 34 percent. (Not to mention she now owns a vacant lot where her house once stood.) Instead, she talks about the explosive growth in service and classified categories. Employment classifieds are up 109.1 percent and classified other is up 20.4 percent. The result, she says, is that total advertising revenue is up 0.2 percent. Barrett turned to the Knight Ridder corporate team for staffing help and expertise. Within two weeks all of the sales territories had been redrawn, all businesses had been surveyed to find out who was open and new rates had been created. In addition, the Columbus Ledger-Enquirer stepped in and served as the ad department and classified center for the Sun Herald. 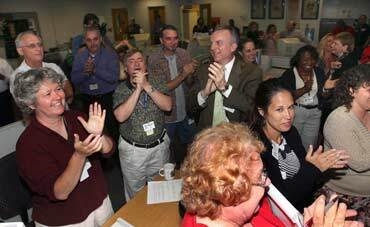 Executive Editor Stan Tiner, left, celebrates with Sun Herald staffers as news of the paper’s Pulitzer Gold Medal for Meritorious Public Service Journalism is announced by The Associated Press. Keeping revenue up as business stabilizes over the next few years is important, too. A free-distribution job guide was recently introduced and the paper will soon launch a home and design section. With several grand openings expected over the next two years as businesses rebuild, the paper is aggressively pursuing a strategy of vendor-supported special sections. Read remarks from Publisher Ricky Mathews and Executive Editor Stan Tiner by clicking here. 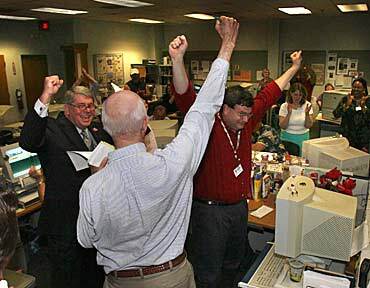 The Sun Herald won the Pulitzer Gold Medal for Meritorious Public Service for its incredible performance in the aftermath of Hurricane Katrina. Is This Cool or What? Meet the winners of the 19th annual James K. Batten Knight Ridder Excellence Awards competition.